These replacement coils are intended for the Innokin iClear 16 Clearomizer. The iClear 16 is a Dual Coil clearomizer designed for the iTaste MVP, but works with all 510 threaded eGo's or other 510 devices with an adapter. The iClear 16 dual coils have 2 long wicks (1 per coil) for more consistent flow of juice to the coils in any position! Dual coils provide much more vapor and better flavor than single coil designs. Extend the life of your clearomizer by replacing only the coil! It's easy to do: just unscrew the tip, then the tube, unscrew the coil and replace it with a fresh one. Then put the tube back on, followed by filling with e-liquid. Put the tip back on and lay it on its side for a few minutes before using to allow the coils to become fully saturated. Simple and quick! I've tried a few clearomizers out thee and iClear's are simply the best so far. What an incredible product! Keep'em coming SmokTek and I'll keep on ordering!! Work very well for me. Never had a problem. The Replacement Coil Head IClear Dual 1.5 Ohm is good but do wish they sold 1.2 Ohm so the battery's would last longer in between charges. These coils are fantastic! They are easy to install & last for quiet awhile depending on how much you vape on the clearo. Highly recommend! 1.8 ohms is the way to go. I wish they had these in a 30. Works great! Bought the 1.5 ohm to use on a standard voltage battery. Had an issue where 1 of the coils was grounded out against the body, so had to move the wick around to get it to unground itself. I use it in my Vision iclear 16 tank. I recently switched to these clearomizers and find the replacement of the guts very easy and cost effective. Great product. I ordered a pack of 5 of these and they are a great deal. I get a nice throat hit from the I clear and love it when I do use it. One dual coil did not work! 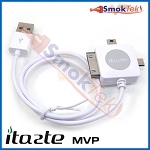 Q: i have an itazte mvp2.0 with 2.1ohm will these coils work for me ? As long as you have the Innokin iClear 16 clearomizer (link below), these replacement coils will work great with the Innokin iTaste MVP 2.0. Q: Since this tank isn't made anymore I'm having a lot of trouble finding the original coils for these. The original coils look like your pic (4 large coils) but what I've been getting from other vendors is some china made junk. Could you please verify what coils you have? Thank you. I'm glad to help here! These are authentic Innokin iClear 16 Dual Coil Replacement Coil Heads. Q: Will this coil fit my Vision Spinner 900mAh Variable Volt Batteries 2 - 3.5ml Vision Vivi Nova ? The Innokin iClear 16 Dual Coil Replacement Coil Head is not compatible with the 3.5ml Vision Vivi Nova. 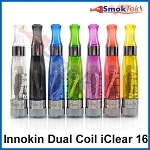 I'm posting the link for the Innokin iClear 16 below. The replacement coil head is designed for this clearomizer. Q: I use to order just the wick w/o the tank, but have spent 30 minutes searching for it and can't find it, so I am forced to order this product. Where do I find it? I'm very sorry for the confusion. The Innokin iClear 16 Dual Coil Replacement Coil Head is the wick without the tank. You are on the right product.